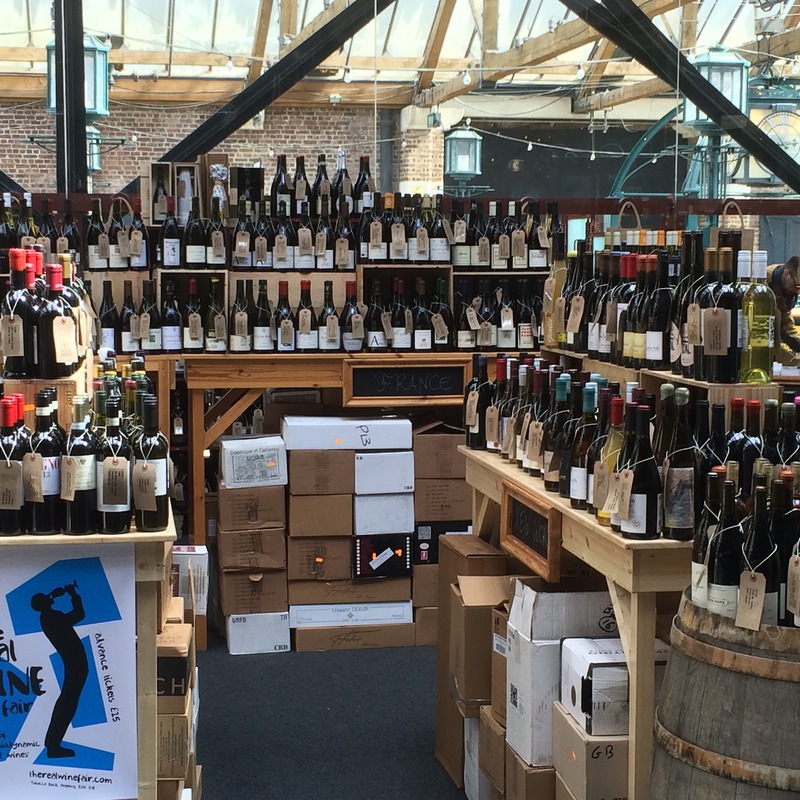 I was at East London’s Tobacco Dock yesterday for the Real Wine Fair. 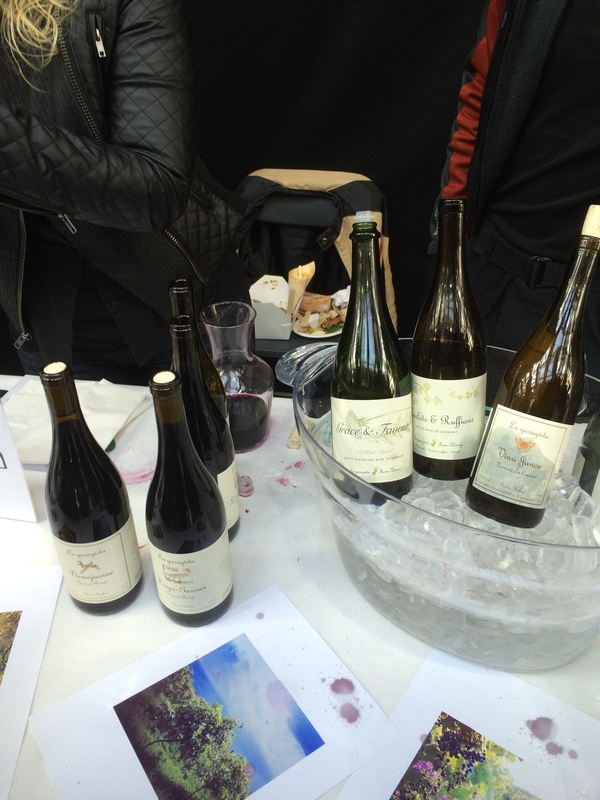 This is an event for natural and low intervention, organic and biodynamic, winemakers organised by Les Caves de Pyrene, the wine agency who were first responsible for promoting a complete portfolio of these wines in the UK. 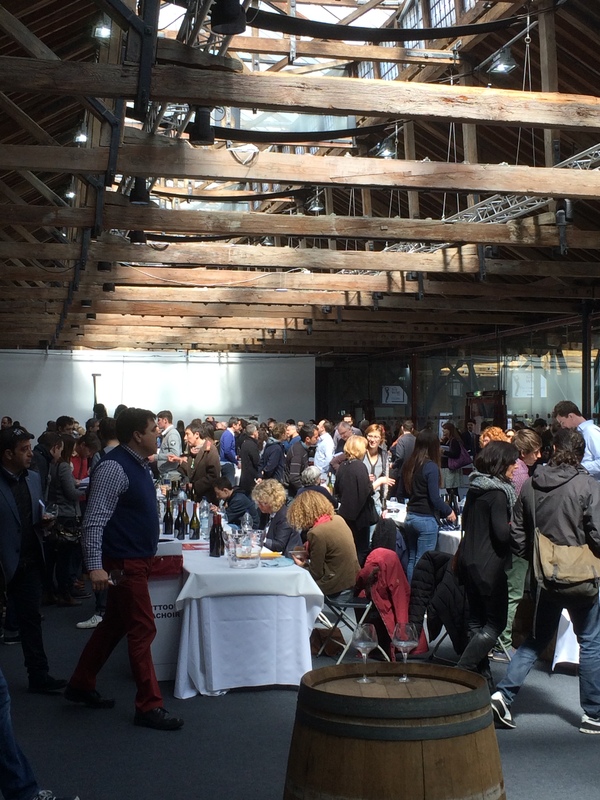 The two day fair, showcasing more than 160 producers, goes hand-in-hand with Real Wine Month, promoting artisan producers through independent wine shops and bars throughout the UK, and which (presumably by coincidence) leads up to the other major natural wine event in London this year, RAW Wine (15/16 May 2016). The Real Wine Fair this year was a far cry from the first event Les Caves organised in a small, sunny, room in West London some years ago. The Tobacco Dock venue has its negatives (the usual Sunday engineering works on both Underground and Overground certainly made getting there a bit complicated for some producers unaware of closures), but it provides a good tasting environment up until the point when the post-lunch crowds on the public day make it a bit of a tight squeeze. The food court was excellent, and even better was the well stocked on-site Caves de Pyrene shop – I managed to lug six bottles home with me, but I rather wish I’d opted for a suitcase. I certainly didn’t get round anywhere near all 160 producers, each showing (at a guess) an average of five cuvées, but I spent a good four or five hours tasting. So in this Part 1, I plan to mention three interesting producers I spent more time with, and then in Part 2 I shall give a more general picture of what else I tasted. I’ll begin with the most unusual. 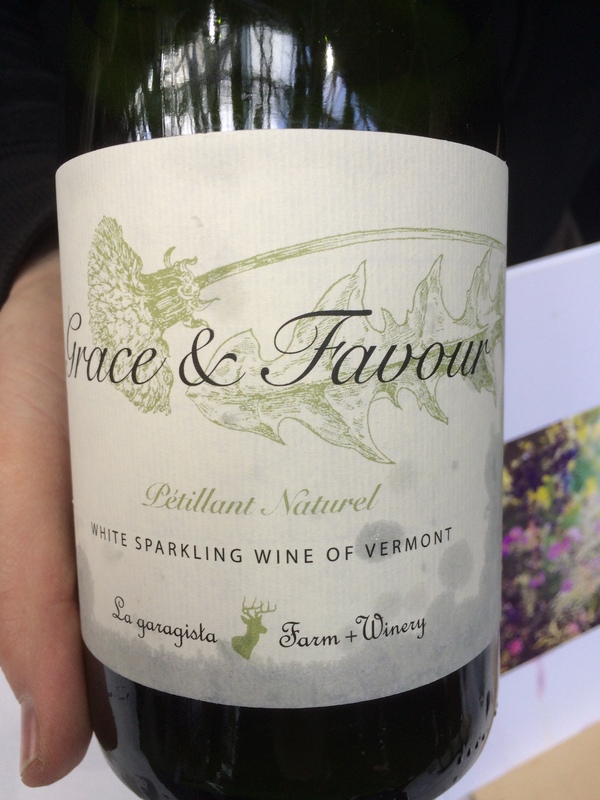 There were, without doubt, plenty of weird (and usually wonderful with it) wines on show, but the prize for the most unusual portfolio might well go to a winery from a place that even I’ve never tried wine from before – Vermont. The North American wall of producers was pretty exciting, lots of interesting wines, and I see a few of the established wine journalists have already been mentioning one or two on social media. But perhaps La Garagista Farm and Winery were just a little odd for those more esteemed pens. Garagista are located on Mount Hunger, just east of Lake Champlain. Their stand had a very helpful hand drawn map to help us out, because my North American geography was certainly not up to locating them with certainty. The philosophy here is both that of natural wine and biodiversity in the vineyard, and on the wider farm homestead. It’s very much a community based philosophy as well. 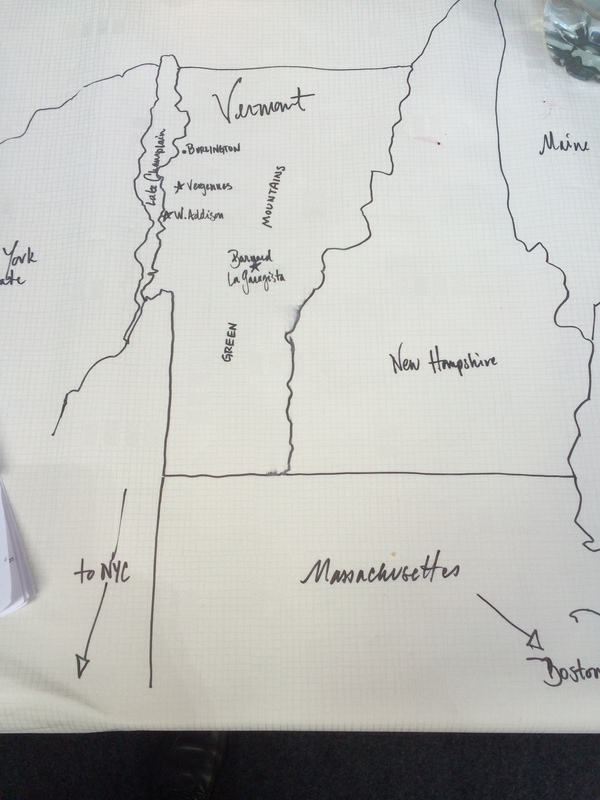 The wines are distinctive, not merely because of their origin, but because of the grape varieties used up in the cool climate of Vermont (cool? temperatures can reach -30 in a bad winter). 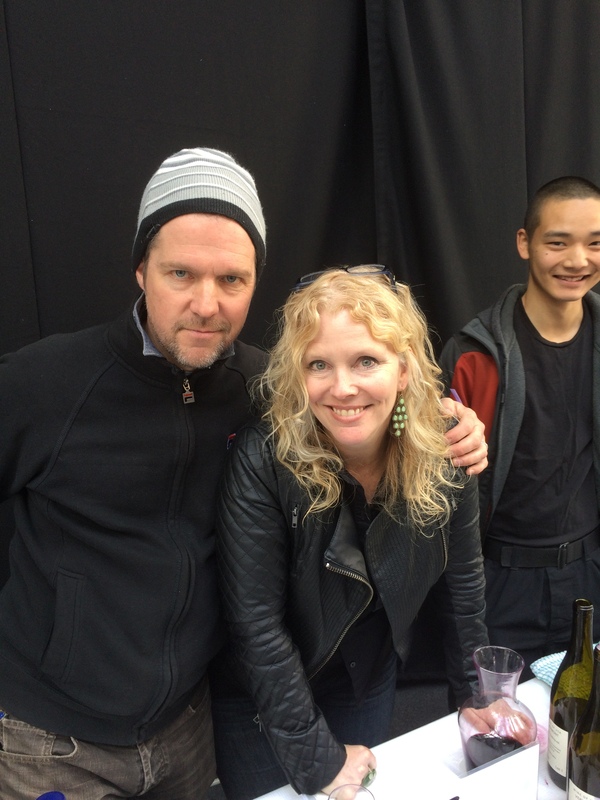 Five wines were on show, and they were presented by chief winemaker Dierdre Heekin and one of her team, Caleb Barber. Grace and Favour 2015 – this is a crown cap sealed pét-nat, bottle fermented but without disgorgement. A great example of the genre, relatively simple but refreshing and lively. Made from Black Muscat, there’s enough of the Muscat family’s aromatics to identify it. Great fun, and indeed, it was one of the half-dozen wines which made it home with me, as much for its unique provenance as anything else. The only negative, this retails in the upper 20s (£ Sterling), making it substantially more expensive than some pretty good European pét-nats. Vinu Jancu 2014 – the name intrigued me. It’s Sicilian dialect for dry wine, and it undergoes five weeks’ skin maceration. It exhibits the usual texture of a skin contact wine, also evident in the onion skin colour. It’s also cloudy, but very fresh and very interesting. My favourite of the two whites. Damejeanne Rouge 2014 – Another US developed cold climate hybrid, Marquette, combines with 10% La Crescent to make a wine that has some of the flavour characteristics of Pinot Noir, with quite concentrated cherry fruit, along with a slightly bitter or earthy finish so often seen in wines made from hybrid vines (similar to the Luckett Vineyards wine from Nova Scotia which we tasted at the last Oddities lunch). Loups Garoux Rouge 2014 – the pick of the two reds, a single site wine from their West Addison vineyard, almost beside Lake Champlain. Served from carafe, this is really intense. There’s concentrated blackcurrant with cherry, and a bitter elderberry (Caleb’s take)/redcurrant (my less educated take) on the finish. Frontenac Noir is the grape variety. A really interesting range of wines from a state not well known for its wines (I believe this producer is the state’s only exporter). Worth exploring, partly for their obscurity for sure, but also in their own right. I’ve written about Stefano Bellotti and Cascina degli Ulivi (Piemonte) before, but until yesterday I’d only tried his skin contact white, A Demûa. A chance to taste the range and meet the man was a privilege and a treat. Stefano took over his grandfather’s vines in the mid-70s, converting to biodynamic practices a decade later. His farm is one beautiful integrated ecosystem, with mixed crops and husbandry complementing the vines. If you want to see a little of Stefano, and to get an idea of the problems he has had with the wine authorities for creating this beautiful, chemical free, piece of Northern Italy, watch Jonathan Nossiter’s film, Natural Resistance. Bellotti Bianco “Triple A” Vino da Tavola  – sealed under crown cap, light sparkle, 100% Cortese from Tassarolo. 12.5%, light filtration and a touch of sulphur. A simple wine for happy quaffing, perhaps, but still a good (and lively) introduction to Stefano’s stable. 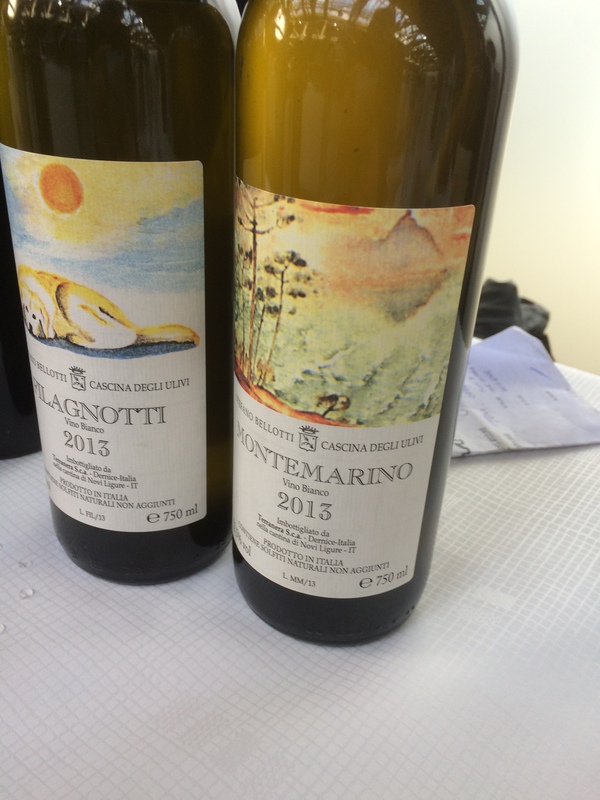 Gavi 2014 – Stefano does attain the DOC sometimes. You wonder why, considering so much Gavi is dull, and this certainly isn’t. South facing slopes on red clay, 100% Cortese (as the DOC requires). What you notice is the freshness with this wine, and that for such a renowned natural winemaker (substitute “notorious” if you are a local bureaucrat) you don’t get anything scary or odd. It’s just a lovely, well made wine, no flash, no hype. A Demûa 2014 – so nice to taste the new vintage of this. It’s here that Stefano leaves the box, perhaps more than with his other wines. It’s a blend of Timorasso, Verdea, Bosco, Chasselas, Musqué (Chossellot) and Riesling, sold as a Monferrato Bianco. These are seriously old vines (some more than 100 years old). “Demûa” is dialect for “fun and games”, and that’s what this is. Nine months of skin contact creates an onion skin colour, more texture and scents of flowers. The palate has nuts and a saline lemon finish. Stefano counsels (well, ably translated as he speaks little English) serving this not too cold, at cellar temperature rather than from the fridge. Simply stunning. Another of the wines I brought home, even though I shall get more next month. 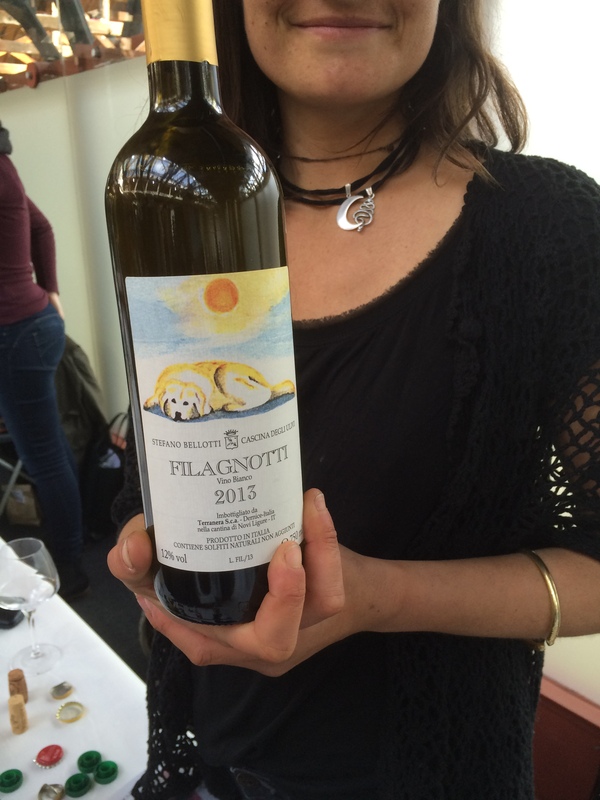 Filagnotti 2013/Montemarino 2013 – these are two single vineyard Cortese. Montemarino (Monferrato DOC) is one of the highest hills of the Gavi zone. The wine undergoes three days maceration and is aged in 15hl oak, old of course. An elegant wine from grapes grown on limestone. By contast, the Filagnotti (Gavi DOCG) vineyard is on red clay, exposed South West, and ageing is in 25hl acacia wood, on lees for around 11-12 months. They are again both 100% Cortese, and therefore a great advertisement for the existence of terroir: two beautiful, if subtly different, wines. Perhaps the Montemarino has more floral elements, the Filagnotti more typically almonds. Bellotti Rosso “Triple A”  – the red version of the first wine tasted. This is a Dolcetto/Barbera blend from multiple sites. A rich, dark red, sealed like the Bianco under crown cap, 13.5% alcohol and no added sulphur. Just like you’d imagine (good) natural wine to be, joyful quaffing for rich Italian food. Dolcetto Nibio 2008 – a nicely aged single variety made from a very special local strain of Dolcetto (Nibio means red stalk, reminding me of Jura’s special red-stalked Chardonnay), a biotype which Stefano thinks has been around Tassarolo for a thousand years. It’s a tannic wine, despite its age (it has forty days’ maceration and a year in old oak), and it is meant to represent an example of the traditional red of the region, despite the relative lack of appreciation for Dolcetto in contemporary Piemonte. Sappy and delicious. 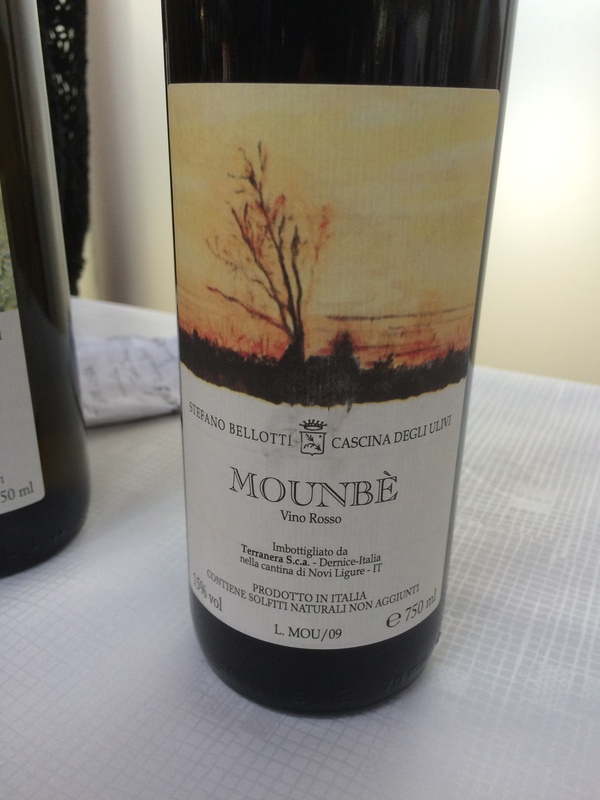 Mounbè  Piemonte DOC – Pure Barbera from Montebello, also with a nice amount of bottle age, and my personal choice of the reds tasted. It gets a few months longer in wood than the Dolcetto, and wood of differing sizes. The wines may be quite structured when young, but this has aged beautifully, the kind of Barbera which, despite the temptation to reach for a Nebbiolo on such occasions, would partner Piemonte’s rich game cuisine so well. Stefano Bellotti has had a sort of myth created around him, a contadini at odds with officialdom and a champion of natural wines. Yet he doesn’t shy away from using a little sulphur, and he’s not averse to happily sharing his vision of biodiversity with visitors. His wines are just lovely. They are clearly different, yet there’s nothing weird about them – although the A Demûa is a touch unusual. 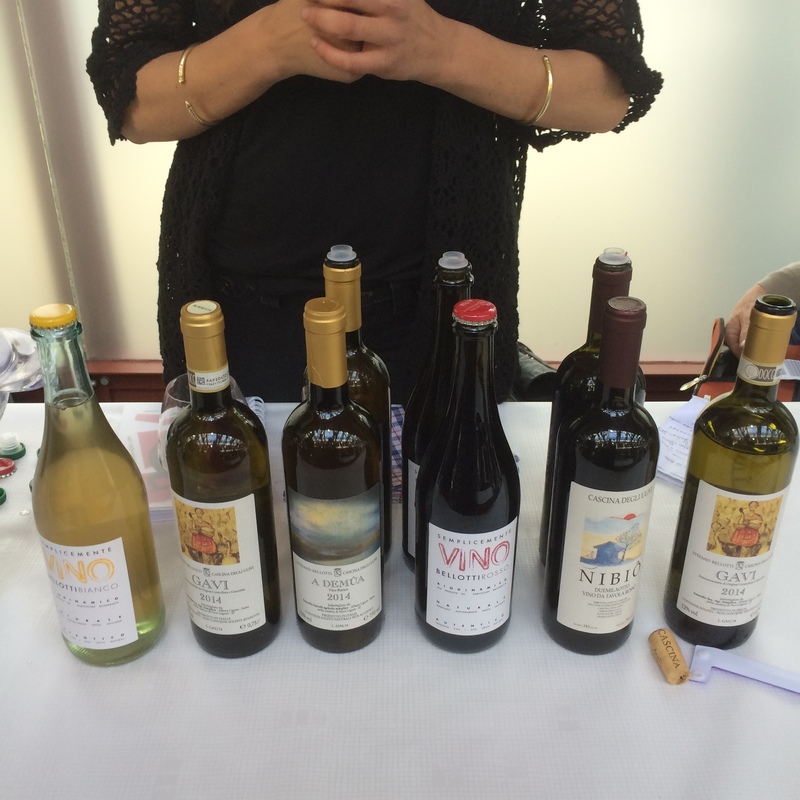 I almost can’t quite put my finger on why I’m more drawn to Stefano’s wines than so many others…but I am. 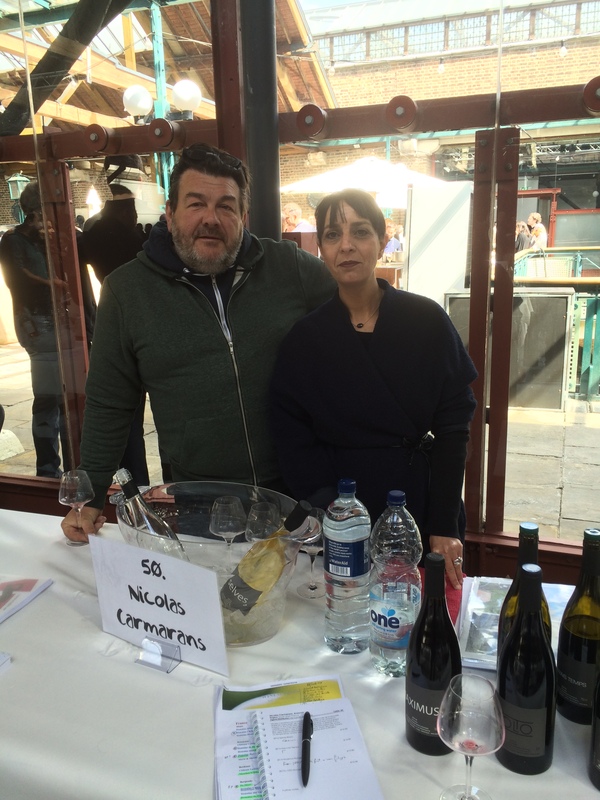 The last producer I want to highlight today is Nicolas Carmarans. Nicolas doesn’t have a web site. He makes wine in one of France’s poorest yet most beautiful departments, Aveyron. His domaine is located near Montézic (near the reservoir lake of the same name), by the River Truyère, just north of Entraygues. We’re a little northeast of the glowing pink-stoned city of Rodez here, and just west of the barren but beautiful Monts d’Aubrac. Nicolas used to run the Café de la Nouvelle Marie in Paris, which some long time followers of the French natural wine movement may recall. He and his family moved full time to take on just over 3 hectares of Chenin, Fer Servadou, Negret de Banhars, Cabernet Franc and Malbec (a very typical local mix) from which he makes a range of fine Aveyron IGT cuvées. 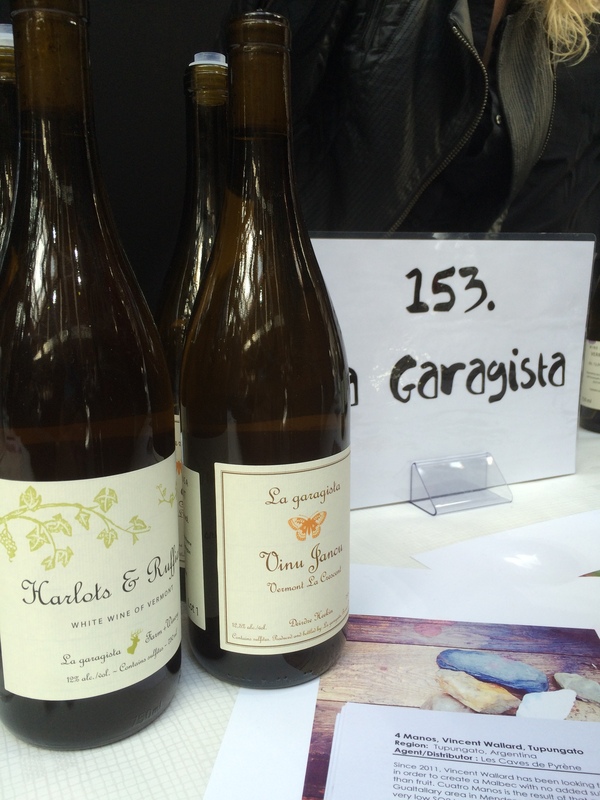 Selvès Blanc 2014 – is a nice pure Chenin which tastes fresher than many Loire versions. A bit more mineral perhaps, no pear or quince, and too dry for tarte-tatin notes. It’s a wine which initially strikes as quite simple, then some complexity builds in the glass. A grower, as they say. Given time you’ll love it. Mauvais Temps 2014 – I didn’t ask “why the name?”, but this vineyard is part of a large 20 hectare slope where the vines were killed by the terrible frost of 1956 (see link to article below, where I found this fact). It is a red blend of 60% Fer, 30% Malbec and 10% Cabernet Franc. This is very approachable and drinking nicely now. It’s kind of an entry level red in some ways, but that’s not a criticism. It’s a wonderful wine, I’m almost tempted to borrow a Parker phrase for the amount of tangy fruit (but I won’t). In fact, this is another wine which accompanied me on the train home. Maximus 2014 – is pure Fer Servadou, the unique grape of the region. This cuvée is from granite soils. There’s that iron filings note in evidence, the one you also get with Marcillac reds, which somehow evokes the volcanic soils quite common around here. But the fruit is really concentrated too, quite dark fruits with a brambly edge. This is a lovely wine, though it might well benefit, get even better, from a little age. L’Olto Rouge 2013 – this has benefited from even one extra year in bottle. Again, 100% Fer, but from argilo-calcaire (limestone) soils this time. Quite brooding, if that’s not too indistinct a descriptor? A lovely wine, drinking now (for me, though I can’t claim expertise, it has less potential to age than the Maximus, which is reflected in price – though all these wines are great value, nothing pushing above £20). The excellent Wineterroirs Blog has a very good article on Nicolas from January 2012, to which you can link here if interested. Do visit Aveyron if ever you can. It’s rural and tranquil in a way which much of France used to be thirty years ago. The wines of Marcillac are reasonably easy to find in the UK, less so those of Entraygues(-et-du-Fel) and Estaing. But amid the deep river valleys and heavily wooded slopes you will discover the old village of Conques. The village and its restored abbey church are enough of a draw, as is the abbey’s treasury containing reliquaries of rare beauty. 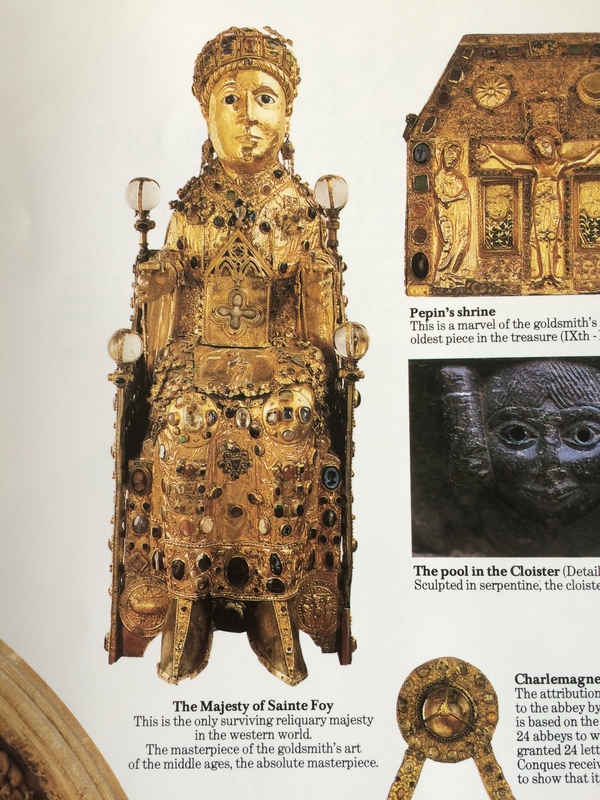 But amid these treasures is one of the finest examples of religious art in Western Europe, the Majesty of Sainte-Foy (Saint Faith), a golden statue, almost life-size, of the enthroned child martyr covered in rare gems (just about anything you can imagine from sapphires and pearls to emeralds and topaz, along with cameos and intaglios from classical times). Of unknown date and origin, Bishop Bernard of Angers was worried in 1010 that it might be just too beautiful as a religious object. It certainly has that level of beauty. An astounding piece of craftsmanship. This entry was posted in Natural Wine, Wine, Wine Agencies, Wine Tastings and tagged Aveyron, biodynamic wines, Cascina degli Ulivi, Dierdre Heekin, La Garagista Farm and Winery, Les Caves de Pyrene, Majesty of Sainte Foy Conques, Natural Wine, Natural Wine Fair, Natural Wine London, Nicolas Carmarans, Real Wine Fair, Stefano Bellotti, Vermont Wine. Bookmark the permalink. I also found my way to the La Garagista stand at the fair today which was unexpected pleasure. The wolf like label on the Loups Garoux cuvee and the word Vermont caught my eye warranting further investigation. I loved hearing about their project/story from Dierdrie and how they were utilising US hybrids to make wine in their particular environment. Really enjoyed the Gamay style on the Damejeanne Rouge so much so that I picked up a bottle from the shop to take home. A true Oddity and an estate to follow I think. Good to see you on Sunday, Mark. I’m also glad someone else enjoyed La Garagista. 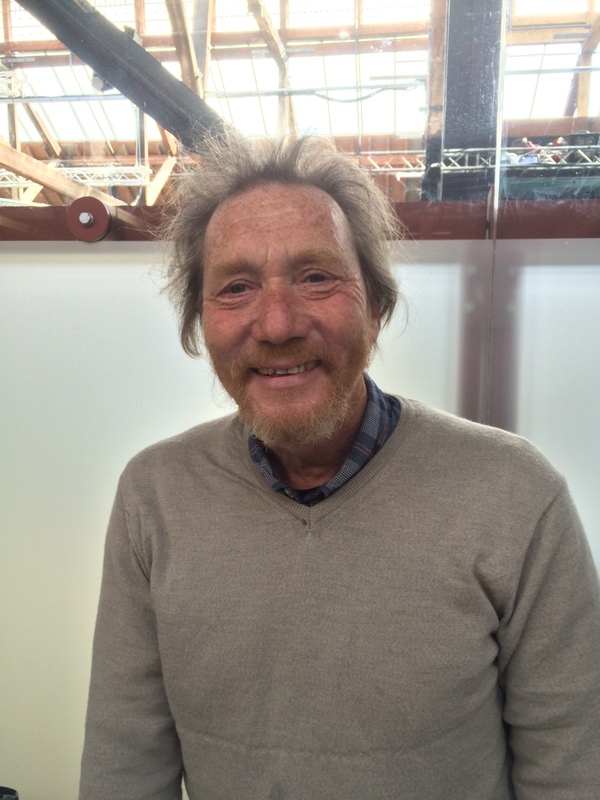 Great to read your experiences David, I shall use them as incentive to write up my own yesterday. Happily not too crowded though busy by mid afternoon. As I left at 5:15 it dawned on me that I’d forgotten to return to Bellotti, there were crowds 3 times when I went. My loss, I do like the wines. Very happy you liked Carmarans, he is very talented and I mustventure north to Conques when I return this weekend. I went to Garagista, this time I battled through a throng, the lady wasn’t there but Caleb was very helpful. Interesting, I can’t say that I liked them beyond the curiosity level. The Aramon relative of Loups Garoux was my preferred wine though I found it a little foxy. Liked their biodiversity and understand their need for rare cépages, I wish them well. Off the top of my head La Stoppa, Thorle, Testalonga, Kagami and Alexandre Bain were my highlights but there were plenty from Austria, the US and then there’s Occhipinti! I was fatigued by ‘skin contact’ wines, often clumsily heavy, but there were plenty of highlights. We were lucky with the travel, very smooth. The venue was a little cold even in a crowded room but was a good space. Final comment here, most of the Georgians must have had a very big night Sunday, the survivors told a tale about those too ill to make Monday! I agree with your highlights. Few people seem to know Thörle, but I’ve had a few from Solent Cellar. I’m pretty sure Kagami’s Domaine des Miroirs wasn’t showing on Sunday. A shame. I have a friend who has some wine from him but have never seen it in UK.